Media captionCongresswoman Frederica Wilson: "How insensitive can you be?" US President Donald Trump says a claim that he made insensitive remarks to the recently bereaved widow of a soldier is "totally fabricated". Congresswoman Frederica Wilson said he had told Myeshia Johnson: "He knew what he was signing up for, but I guess it hurts anyway." The Democratic lawmaker said she was shocked by the alleged comments. Sgt La David Johnson was among four US special service soldiers killed in Niger by Islamist militants this month. Mr Trump had already been criticised for not contacting the families of the dead servicemen right after the fatal ambush on 4 October. In US politics, nothing is off-limits any more. After (inaccurately) swiping at his predecessors for not calling the family members of US soldiers killed in combat, Mr Trump is on the defensive over allegations he mishandled a call with a grieving widow. The accuser is a partisan Democratic congresswoman and the president, not surprisingly, is pushing back hard. This controversy is spiralling towards the gutter. Mr Trump made this bed, however. He was quick to cite the slain son of chief of staff John Kelly to justify his contention that Barack Obama didn't always make phone calls. Then there were the disparaging comments candidate Mr Trump made last summer about the parents of a Muslim-American soldier killed in Iraq. The more this story drags on - and it will drag on - the more damage it could do to a president who wraps himself in the symbols of patriotism and the military, but is in danger of being viewed by the public as lacking empathy when it counts most. An important presidential role is consoler-in-chief during times of tragedy. Successful politicians learn early that they need a human touch. It's a job Mr Trump, the anti-politician, has little experience doing - and it shows. The president tweeted on Wednesday morning: "Democrat Congresswoman totally fabricated what I said to the wife of a soldier who died in action (and I have proof). Sad!" Mr Trump has yet to provide any evidence. A White House official said Mr Trump's conversations with the families of dead servicemen were private. Mr Trump later told reporters: "I did not say what she [Ms Wilson] said... I had a very nice conversation." When asked about what "proof" he could offer, Trump said: "Let her make her statement again, then you will find out." 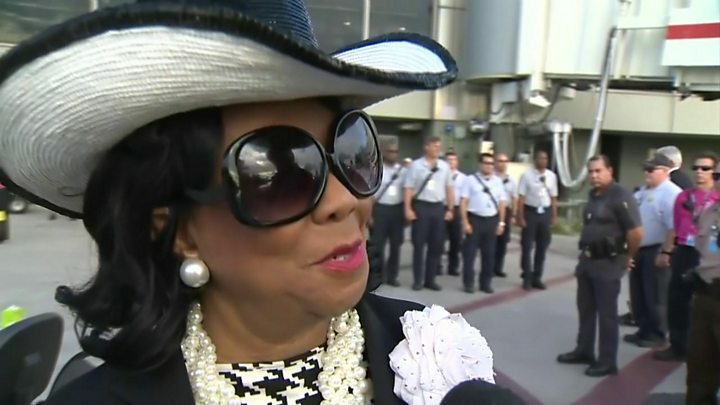 Ms Wilson, who represents a Florida district, told CNN the president's call had been made shortly before Sgt Johnson's coffin arrived by aircraft in Miami. Ms Wilson told WPLG, a Miami TV station, she had heard the president's "so insensitive" remarks to the widow on speakerphone in a limousine. "Yeah, he [President Trump] said that," Ms Wilson said. "To me, that is something that you can say in a conversation, but you shouldn't say that to a grieving widow. Ms Wilson told the Washington Post that Ms Johnson, who is expecting the couple's third child, had broken down in tears after the conversation. "He made her cry," Ms Wilson said. The congresswoman told the newspaper that she had wanted to grab the phone and "curse him out", but an army sergeant who was holding the handset would not let her speak to the president. She later responded to Mr Trump's denial by tweeting: "I stand my account of the call with @realDonaldTrump and was not the only one who heard and was dismayed by his insensitive remarks." And Sgt Johnson's mother, Cowanda Jones-Johnson, told the Washington Post newspaper that President Trump "did disrespect my son". She said she was present during the call from the White House on Tuesday, and stood by Ms Wilson's account of the call. How did this row begin? Mr Trump has been on the defensive over the deaths in Niger since a reporter asked him at the White House on Monday why he had still not called the families. 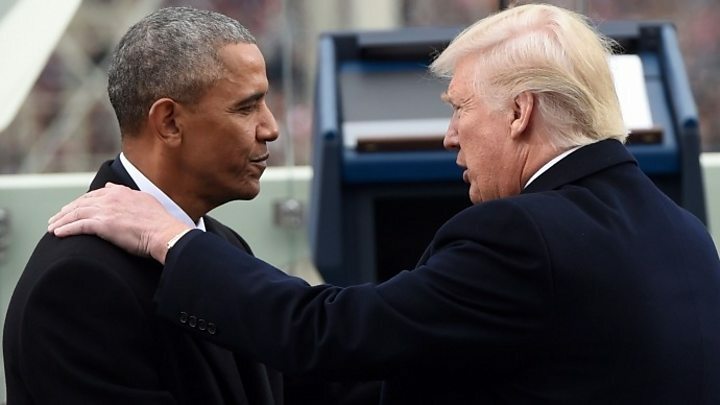 He provoked fury by falsely claiming that his predecessor, Barack Obama, and other former US presidents had not called the relatives of dead service members. Mr Trump also said he had written letters to the families of the four killed in Niger and planned to call them soon. The White House later said the president had spoken to the families but it did not say when. On Tuesday, Mr Trump ratcheted up the row by suggesting that President Obama had not called the family of Mr Trump's chief of staff, Gen John Kelly, when his son was killed in Afghanistan in 2010. The Associated Press says that like presidents before him, Mr Trump has made personal contact with some families of dead soldiers - but not all. "What's different is that Trump, alone among them, has picked a political fight over who's done better to honour the war dead and their families," the news agency reports. "He placed himself at the top of this pantheon, boasting Tuesday that 'I think I've called every family of someone who's died' while past presidents didn't place such calls." Have there been previous run-ins? This is not the first time Mr Trump has found himself in an imbroglio over US veterans. As presidential candidate, he mocked Senator John McCain for having been captured as a prisoner of war in Vietnam. He also engaged in a racially charged feud with the parents of decorated army captain Humayun Khan, who was killed in Iraq in 2004.